Woodsball is the heart of what we do here at Splat Action. 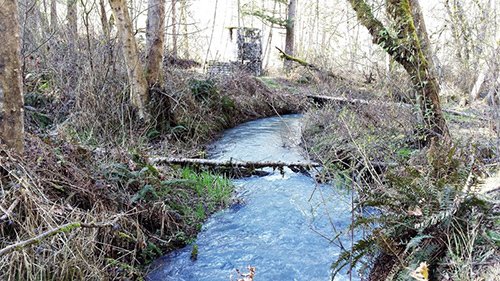 Nearly all of our 47 acres is forested and provides a wealth of variety in playing fields, everything from fortified castles to raw woodlands. We have twenty standard game formats to choose from and can customize the scenario to fit your group as needed. 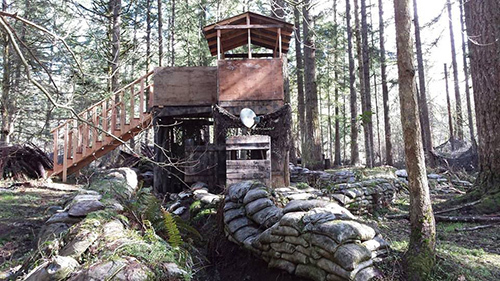 Woodsball is simply a term for any game of paintball played in the appropriate terrain, but some things about this designation are relevant, regardless of whether you are playing single elimination or capture the flag. 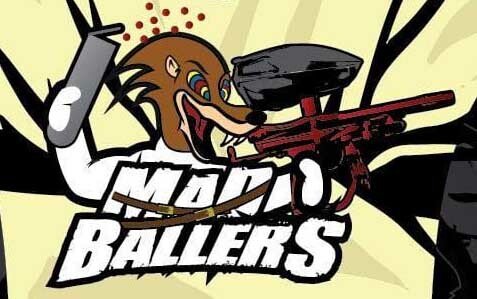 Whereas conventional paintball relies on speed, aggression, and daredevil bravado, in woodsball, stealth, endurance, and tactical finesse are the hallmark virtues of the game. The terrain is a weapon to use against your opponent and a shield to protect you and hide your movement. Your brain is the most important muscle to use and a patient, observant player is often the most dangerous. 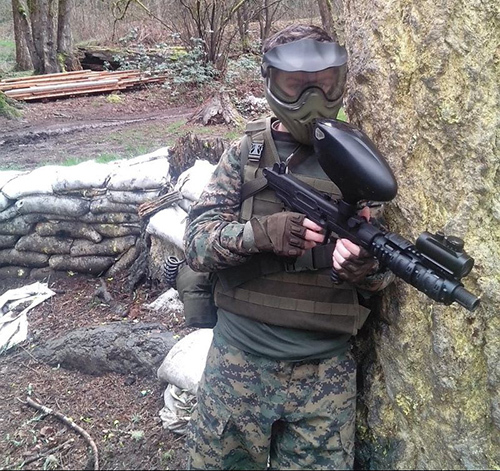 There is still plenty of room in woodsball for rushing across the field and charging into the teeth of the enemy, but the game is more dynamic and varied in the way it plays out. 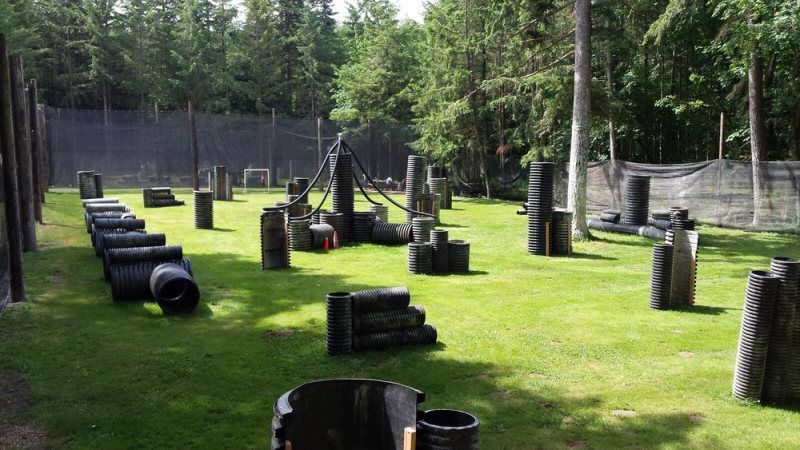 For those seeking a more adrenaline soaked experience, Splat Action offers several fields outside the heavily forested areas where the action is more upfront and fast-paced. We define any game on one of these areas as “hyperball.” The primary differences between a game of hyperball and traditional speedball is that we use permanent bunkers instead of inflatable ones and we do not host standard tournament format games, which rely on a perfectly mirrored set of bunkers on each side of the field. Other than that, the play-styles are very similar. The action starts almost as soon as the game begins, aggressive firing and maneuvering is used to dominate the field, and the rounds tend to last no more than about ten minutes or so. The centerpiece of our hyperball games is Nuketown, set right in front of the main booth and staging area with excellent views and benches for spectators. This extra-large hyperball field offers intense action without a long march to the playing field. The other hyperball courses at Splat Action are the Grass Mounds, the Town of Deadwood, and a lightly forested, short range course near the front called Field One. Here at Splat Action our low impact markers are not like the cheap plastic toy markers that most other play fields use. We use a high quality marker designed to shoot at lower speeds, With our markers and method, low impact players engage in a more realistic experience. All this is possible by using a more brittle ball at lower velocities giving hits a much softer, less intimidating sting or impact. Low impact is great for: young players, youth groups, birthday parties or family outings. At Splat Action we can host your Airsoft group on any field of your choice. All day play (if you have your own gear) is just $20! Sorry, no airsoft rentals at this time. You MUST have your own gear. You may bring your own BB's (must be bio-degradable) or buy from us. Call us or email to book your group!